You may not know it by our posts, but we are parents. Our child is a 5 year old fur baby named Mimi. While Mimi gets to sample a fair amount of our Geeks Who Eat recipes, she has never had one made especially for her. When we were asked to create a recipe for Isle of Dogs we knew this was our chance! Therefore, here is Mimi’s very own dish, Onigiri Dog Treats! When coming up with this recipe we knew from the start we didn’t want to create a standard Japanese inspired dish. Instead, we would take inspiration from the dogs of the film. Rather than creating a Japanese recipe, we created dog treats with chicken and brown rice. 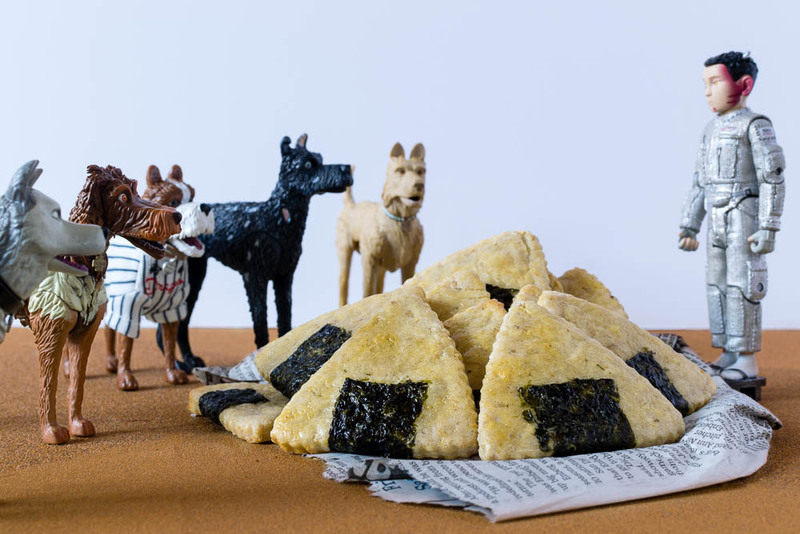 These dog treats ended up being inspired by the Japanese snack, onigiri! 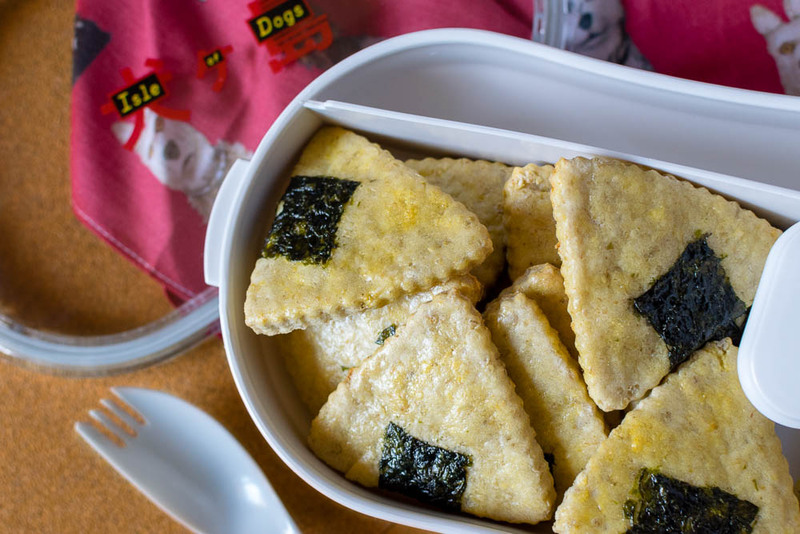 Our Onigiri Dog Treats are super easy and your dog is going to love them! Mimi sure did! Now while your pupper is enjoying one of these delicious dog treats, it’s time for you to go to the movies! We are giving away 10 pairs of screening tickets for a sneak preview of Isle of Dogs! The screening will be held at Harkins Valley Art on Tuesday, March 27th. The screening starts at 7 pm and the winners should arrive at 6:15 in order to guarantee their seating. Winners will be selected on Monday, March 26th. Good luck! Combine chicken, rice and chicken stock in a blender. In a bowl combine the flour, 1 egg, and salt. Add the chicken mixture and stir until clumpy. Flour your work surface, then kneed your dough until well combined. Roll out your dough until 1/4 inch thick. Using a triangle shaped cookie cutter, cut out the treats and place on a parchment lined cookie sheet. Wrap the botton of your treat with a piece of nori using a small bit of water to secure. Using the other egg, create an egg wash.
Brush the top of your treat with a light coat. Let cool and share with your favorite pup! *The Geeks received no compensation to facilitate this write-up; opinions are wholly our own. Advanced Screening tickets provided by Allied Marketing. View our Disclosure Policy for more info. I think my dog will love this treat. I am going to make it for him.